check out the prophecy again, it was one pope that lead the ship toward the pillars (JPII).... and another that secured it between the 2!!! As I commented on earlier, actually before the election of Benedict, two popes are mentioned in the prophecy. The first definitely refers to John Paul which at the time of the election gave me great hope that the second would be a worthy successor of John Paul. I was very happy when Benedict was chosen! I am watching an encore of our Holy Father's arrival on the boat. It's commented that the boat is sailing towards the "twin towers of the Cathedral", interesting correlation to John Bosco's vision/prophesy involving twin pillars? "Breaking through all resistance, the new Pope steers his ship safely between the two columns; first, to the one surmounted by the Host, and then the other, topped by the statue of the Virgin. At this point, something unexpected happens. The enemy ships panic and disperse, colliding with and scuttling each other." Ok, so now the Pope (Benedict 16th) is steering the ship between the two columns... I wonder what that "something unexpected" is? Could it be the worldwide illumination of conscience? This is my greatest hope right now... everyday I read Spirit Daily and various "visionaries" in the hopes that I get a little hint that this "Warning" is about to take place. Boy, then the enemies would certainly "panic and disperse"! May Our Lord grant that it happen soon. Amen. Michael you seem to keep in good touch with the word of God and His prophecies, could you please post on spirt daily the picture of the Schenicka Glory with Pope John Paul the II and the explantion behind it. For forty years we have been walking in the desert.Will this be the Pope who will lead us across the river and back to God? From one Mike to another, Bravo! I'd like to share some ideas with you concerning this key event on the Rhine, for back in November after a year of prayer and research I drafted a letter that was both time sensitive and if I dare say so myself a little prophetic. During this Year of the Eucharist Light and Life, we seem to be missing a key to light the world on fire. If the "Rhine Flowed into the Tiber" at and after Vatican II and the ideas of Northern Europe caught fire as part of the "renewal process," this picture and your blog does indeed seem to chart a new course for Church History, reversing the current, at least symbolically. Please read the article at www.soltlaity.org/breadoflife.htm and keep it in context. I might also suggest a Google Search on the three terms Eucharist, Light, Einstein to draw you to some of the source material that confirmed me a year or so ago. Today after reading "Rhein Energie" on the side of the white cabin cruiser, I am more firmly confirmed in my belief that this is a pearl of great price that must be placed on a mountaintop to shine His Light. As of yet, I have not succeeded in generating interest on the main point of the paper. Fr. Groeschel was pessimistic. Michael O'Brien was supportive but far too busy with his writing and Michael Brown has his Spirit Daily to contend with. The silence is almost to much to bear, for as the heat of this summer seems to be intensifying, time seems short. The signs of the times tell me at least that it is time for a Spiritual Offensive, to fill the pews. Dialogue is the missing key, for we must attempt to spread Truth via word of mouth. We Americans seem top require memorable war slogans to rally the masses such as "Remember the Alamo," "Remember Pearl Harbor." If "Remember Jesus...E=mc2" serves to remind us American Roman Catholics that the Eucharist is our Lord Jesus, His Body, Blood, Soul and Divinity, Light and Life, well then we might make some headway in the battle against the Culture of Death, for it will be Christ and not us. Masses might be packed. I can be reached at 361-563-2602. or jmjriz@aol.com. I wonder if the two pillars are years. The pillar of the host could be the Year of the Eucharist, this year. Maybe next year is the year of Mary??? Just an idea. Great to see the Holy Spirit at work - in Michael's "connections" and in the comments. Interesting as well, is the fact that - as I understand it - St. John told this vision to the young people that lived at his oratory in Turin. And he started the talk by saying, "Try to picture yourselves with me on the seashore...". Wow, did you see all those young people on the seashore yesterday? Just a coincidence? This is great stuff, people (greetings from Ireland b.t.w.) 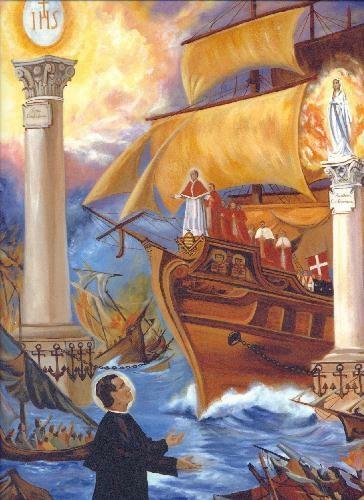 There may be no real link between B XVI arriving in the boat and the St. John Bosco prophecy but even if not, boy, does it not make one lovely, uplifting image? A good lot of our young Irish people are over there in Cologne. May it strengthen their faith for the dangerous times we're living in and which we have ahead of us. "no real link between B XVI arriving in the boat and the St. John Bosco prophecy"? The same day World Youth Day started. And he so loved the young, that it makes perfect sense to see his dream come to fruition at this event. At long last, the Tiber flows into the Rhine! If we are aware of the Don Bosco prophecy so is Ratzinger. What better way to wrap himself in deception and lead so many astray. I don't trust him or like him. he is no john Paul the Great. Dont be so quick to transfer your loyalty to someone undeserving. I have transferred my loyalty, as would do so for whomever was elected as our Holy Father. And I'm sure John Paul prays that we all do. And if you believe that the Holy Spirit still leads The Church, as He always has, you would realize that, even if he wanted to, Benedict could not lead it astray. Wow! He even arranged his own quick election...when it was so in doubt by so many. I'd say, rather, if the prophecy fits..wear it! I agree with Mike F. Didn't Jesus tell Peter he would be the Rock that the church would be built on? And didn't He say the "Gates of hell would not prevail against it"? And the comment of not liking Pope Benedict? Is it possible that Jesus does not like him either? DOTLOT, you need a re-examination of your conscience and thoughts. Remember, we must trust in our faith. God will not lead us astray, nor send us a pope that would do so. Pope Benedict is not the anti-christ you are looking for. I cannot believe someone who "respects" John Paul II would say such a terrible thing about our pope, someone John Paul greatly esteemed to help him safeguard the faith all these years. I pity those who aren't even willing to give Benedict a chance. These are the words Jesus spoke to the two Patricks of Ireland, regarding successor to Pope John Paul II. My children, I come in these Words to tell you that the evil one is about to take his place upon the Throne of My Peter. My children, you have allowed him this with your complacency and lack of Love. You do not look to My Way of Truth; My Gospel. You only see your own ways; the way of the world. You will not believe My Warnings, you will not believe these things could happen. You say, “God would not do these things,” but read the Scriptures. Many times I Warned the people in the past and, when they did not listen, I was forced to come in Justice and this I must do again, for you will not listen. You have flaunted My Words and mocked them. Now watch and see what you have brought upon yourselves. Watch, children, as the evil one takes his place. Watch the devastation and destruction he reaps upon My Church and this you have allowed him. You laugh at My Words; you say, “God would not speak in this way.” You only say this because of the fear of looking into your lives and seeing the Godless way in which you live. Come back, come back, creation, I reach out My Hand to you in these Words. Take it, it is your only chance. Come, I Love you. I think you better read some of the 2 Patricks' more recent "messages". They are very confused and questioning what they have believed. Much too much of the human element there. You know that at the time of Bernadette there were dozens of mis-led people, duped or otherwise, even well meaning, who jumped on the bandwagon. Be very careful and measure anyone criticized by the good fruit they've born. This pope has held to the faith, watched over the faithful, produced good fruit in humility, while others have not remained faithful. I agree with the last comment. I have yet to see our current pope divert so greatly from what John Paul has done. I used be afraid of Ratzinger until I read his actual writings. That has changed my opinions of what I now believe to be a kind, holy and humble man. I'm more willing to trust what Jesus said to Peter in his actual Gospel before I trust some shaky revelations. I can see DOT's concern in regards to the 2 Patricks and our current pope. In fact, prophesy is a part of our faith and is something that most have forgotten about. And, we all love our faith and mostly in Our Lord Jesus. However, I don't believe that if an evil pope were to come, that he (and God forbid a she) would have been sent by the Holy Spirit. I could see if our pope was a "state" appointed pope and not elected by the college of cardinals. Then we'd be forced to take the church underground. Sound like China? This is why I fear China. It's not their army, or their communist government (although a huge cause for concern in our world), but is this a precursor for things to come? Bishops there are "state" appointed, and not appointed by the Vatican. I believe God is calling us home now, through his messenger Pope Benedict, to strengthen ourselves for such times. China does give us hope in this as well. Despite the evil government and persecution, the church still lives there. Maybe Peter the Roman is the evil one the 2 Patricks refer to and that their prophecies are valid. However, this pope is preaching the message of Jesus, the Eucharist, and is reaching to those who do not know Jesus. The evil one, man of perdition, anti-christ, (you pick your favorite name), will not preach that Jesus is the 'only' Son of God. It will be some new age spiritual freak, not the Vicar of Christ. DOT might be right; he might not- but Jesus' words about the gates of hell not prevailing against his Church does not mean the anti-pope will not take the throne of Peter. The gates of hell shall not prevail against the remnant church which may or may not be led by Benedict XVI. The key way to know the anti-pope is that they will start changing dogma, most likely first with the divinity of Christ. Take this for what it's worth; just one Catholic's view of things. But we know there are both legitimate and illegitimate private revelation. A form of the illegitimate would be those provided by the evil one to lead people into confusion. When I hear people say that the Anti Christ will take his place on the throne of Peter, I'm afraid that good people may be lead to question the Church's teaching authority at some point. And I can't help but think that, should a seemingly benevolent individual with supernatural powers (i.e. the real anti-christ) appear on the earth and contradict her teachings, those folks who are being led into confusion are going to find themselves in quite a bind. And many thanks to Michael who runs this sight. I'm so glad I found it, and have been able to share some thoughts about our faith with some good people. God Bless. I am Also very impressed with the Holy Father's visit to Cologne, whose Cathedral contains the remains of the three Magi who came to Christchild bearing gifts. The word Rhein is derived from the celtic word "renos" meaning raging flow which symbolically, might refer to the unrelenting attacks against the Caholic Church. What transpires is the courageous and determined course that this Pope takes, in order to secure and fasten his ship (the Church), between Our Lady(Rosary) and the Eucharist, so that nothing can or will prevail against it.A new and energised Church is born. their course toward impregnable security. i had goosebumps when I saw the picture and read the comments but even bigger goosebumps when i read Mikes comment about Don Boscos birthday being Aug 16th. A major historical and spiritual event has taken place at wyd and so many are blind to see it. Everyone is living as in Noahs time. I believe this event is a strong focus for us before the rapid rise of the tough times to explode on us. the times til now have only been a preparation time. Please everybody, find out about Luisa Piccaretta and the Divine Will. We are about to enter a New Era of Sanctifiction and the events at the moment are a lead up to major events beginning with the Warning. God bless and be prepared. we have just witnessed a major historical/spiritual event. No Doubt!!! August 16th as D.Boscos birthday is no coincidence. HEaven is preparing us loud and clearly for the really tough times about to explode. But so many are living like those in Noahs times. Find out about Divine Will and Luisa Piccaretta and the New Era which will come. Time has just about run dry. Pray pray pray. sorry my first blog. oh well i have underlined my thoughts be sending 2. Perhaps God allowed this.!!!! Nice picture and commentary onPope Benedict. But you are all reading too much into a mere photo. John Bosco's prophecy refers to the new glorious flowering of the church AFTER, the chastisement. It will happen as soon as the true consecration of russia to the Immaculate Heart of Mary is finally accomplished. Sadly,during the imminent chastisement, a pope will die ("the pope falls"), and his immediate successor, ("but another pope quickly takes his place")-leads the barque of Peter to a safe mooring at the pillar. (the consecration of Russia being the saving manuever.) Pope Benedict probably will not be the one to make the consecration of Russia. This trip is just that- a trip!! and nothing more..."columbiad"
Careful, bud. I'm a chemist and this has nothing to do with Albert Einstein. Get a reality check--I'm serious. I'm hesitant to read too much in any of this. 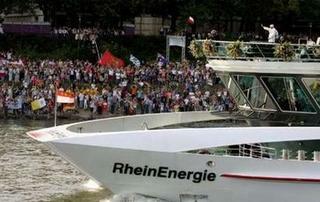 Perhaps the essence of what Don Bosco predicted is coming about, but I doubt it's as literal as a motorboat on the Rhine. Easy folks. Pope John Paul II started World Youth Day and recently gave us the Year of the Rosary and Year of the Eucharist. I heard that for the first time, the vigil service with the pilgrims for World Youth Day consisted of Eucharistic Adoration. On the Stage with Pope Benedict was the repaired Youth Day Cross and a beautiful icon of Our Lady, the same cross and icon that accompanied Pope Benedict to the Cathedral when he disembarked from the boat. Our Holy Father is indeed showing and teaching the youth of the world, and us as well, where to anchor our faith. I have read most of the blogs and have a better understanding of what the "people in the pew" have on their mind. One thing to remember is that "God is still in charge." His will be done. We have a lifetime to be ready for Him. Pray that you and all your family and friends are ready. Intriguing stuff! The last couple of years seem to have been momentous for Catholics like myself. For me, it started with switching cable providers in order to get EWTN, which I now get my daily fix from. Then came the death of JPII (all my great-grandparents came here from Poland, so you can understand how stunned and proud my family and I were when he was announced as the new pope back then) and the naming of Benedict. Lately I have been reading a book on Fatima in part because of the recent death of Sr. Lucia. Also recently I stumbled on the Spirit Daily site and found it very interesting. And now the possibility that St. Bosco's prophecy was fulfilled makes me think that indeed the pieces of the puzzle may be coming together to mark the "new springtime" of the church. All in the Lord's time. Things are moving a little quicker nowadays and I'm sure that this event and that of Garabandal will soon tie together. Remember the warning prior to the 8 day prior notice by Conchita; and it will all coincide with a church event that has rarely been seen...new dogma of the Virgen perhaps?...pray my brothers and sisters so that more souls will be prepared. Jesus Christ has come in the flesh! its indeed marvelous to be able to read about all the prophecies of this age, however like in St Malachy about succession of popes and about the third secret of Fatima, we must acknowledge that there would be a great apostasy , great tribulation which clearly shall befall the church towards its purification.The abomination shall surely enter the church top most leadership. However we know this only happens after a pope is killed and several other bishops martyred. this occurs in the midst of a great war as Fatima's third secret states. until then we as believers must stick ardently to the words of of our Lord that only God knows the hour and the time.